30th March 1958 — 2018 and onwards! Much of our early history up to our marriage is portrayed in the photo album online at https://www.peterwade.com/wades (scroll to the bottom). On the spiritual side Vivien grew up in a non-church family, but all five children were forced to go to Sunday School at the local Church of England (Anglican). After she started work as a milliner at the age of 14 she was witnessed to by other evangelical workers, and she would stick a pin in them for their trouble! However, she was eventually saved and then attended a Baptist church and was baptized. I was brought up in a Salvation Army family, Wesleyan in doctrine. 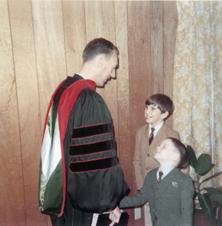 In those days the emphasis was strongly on salvation not social work, and I remained a Salvationist until after my mother’s death when I was 19 years old. Through the radio broadcast Showers of Blessings from the Church of the Nazarene and also Oral Roberts’ radio broadcast, I came to see other streams of Christianity. I decided to checkout Adelaide’s only Nazarene church, where I met Vivien, and eventually Vivien and I fell in love. We both felt called to the ministry, but not in the Nazarene Church, as the Pentecostal truth gradually made sense from the many books and magazines we purchased. 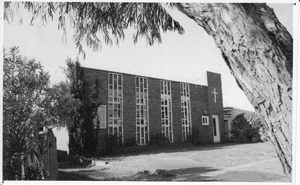 We settled on what was an alive and growing Foursquare denomination in Western Australia after a recommendation from the bookstore manager, and so we started Bible college in 1957 in Victoria Park, Perth at the Life Bible College (now moved to Westmead, Sydney, New South Wales). I graduated as Dux (top) of the college and Vivien was second by one point. That’s another whole story to be told some time! Graduation service from Life Bible College, Western Australia, December 1958. As we look back with that blessing of hindsight, we had been well trained in the life of a pastor. Our sermons were carefully outlined according to the rules of homiletics, and we had a great teacher for all the practical pastoral ministry, even though he couldn’t preach his way out of a paper bag! Theology-wise, prior to college, I had done all of E.W. Kenyon’s courses and had his complete library of books. We also had many books from the healing evangelists who were very effective in the US and worldwide in the late 1940s and through the 1950s, such as T.L. Osborn, Gordon Lindsay, A.A. Allen, and many others. So our understanding of the Bible went beyond the “middle-of-the-road” approach of our denomination. We had prayed for the right appointment “anywhere but Cottesloe, Lord,” so that’s where we ended up for six years of fruitful and busy ministry! Part way through, we and the church joined the Assemblies of God, at that time a national oversight of self-governing, self-sustaining fellowships. 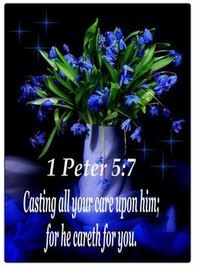 During this period Peter published a magazine on behalf of the church, set up and operated a number of correspondence courses, and wrote numerous articles for Christian magazines, as well as filling the office of State Secretary for the Assemblies of God and Dean of the lay ministers course. A number of his sermons from this period and his magazine appeared in the US minister’s magazine The Sermon Builder. At North Cottesloe we were finally put in an impossible situation when one family wanted to force change outside of the church constitution, so we resigned. Within two weeks, I was invited to the US for three months of summer school! While in the US, I accepted the pastorate of an AOG church plant at Taperoo, South Australia, and we spent 18 months with them before the whole family was invited back to the US to a teaching ministry coming out of the charismatic movement, which culminated in my honorary Doctor of Divinity degree. During the three years there, we were prominent in the group and made hundreds of friends who in later years wanted to have non-denominational family camps, which proved a real success. The outreach church at Taperoo received the benefit of my three-month visit to the US, particularly in understanding God’s Word and in Pentecostal truths, which were evident in the church life. The State leader of the AOG spoke to me when we met in the city one day, and he said he had heard that there were “things” going on at Taperoo that he was not sure about, so I invited him to visit. However, shortly afterward he took the pastorate of a prominent church in another state and never did visit. When we moved to the US as a family in May 1967, the AOG would not transfer my accreditation because I was not working in an AOG ministry. In the half century since that time, Vivien and I have been trans-denominational, sharing the Word of God with His people whatever label they wear. When asked by other ministers who was our “oversight,” I would always reply, “The God and Father of our Lord Jesus Christ” (from my favorite verse, Ephesians 1:3). Upon returning to Adelaide, South Australia, we held home fellowship meetings and taught classes in rented premises in the city center. Then in 1979, together with Lew Smallwood who had attended the Taperoo church, we started the Community Christian Church in Ingle Farm, a new suburb in north-eastern Adelaide. It grew and moved out of the Smallwood home into the conference room at a doctor’s practice, and then into a larger area at the local recreational center. In 1988 I felt God’s leading to pass on the church to another minister, and so ended my pastoral ministry. Two years before starting the Ingle Farm church, I had been invited to speak at a camp run by friends in Minnesota USA in 1977, and again the next year. 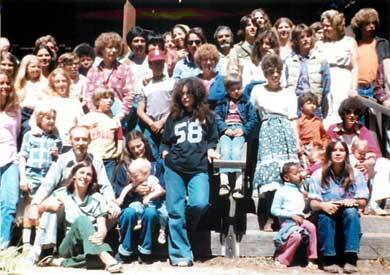 In 1979 a large family camp was held in the coastal redwood forests near Mendocino, on the northern Californian coast, arranged by Bill Morgan. The next year Steve Heefner arranged a camp on the coast of Oregon, which was held a few weeks after Mount St. Helens erupted in nearby Washington state, May 1980. The camp returned to Mendocino for a number of years and at other locations in northern California. On every visit, in addition to the camps, I spoke at home fellowships or seminars right across the US: New York state, Ohio, Kentucky, Montana, Colorado, etc. All this was happening while we pastored our new church. In all, I made about 20 visits to the US in total, and Vivien accompanied me quite often to handle the children’s ministry at the camps. 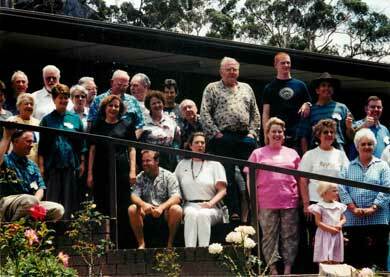 In 2001 and 2003 family camps were held jointly with Norman Campbell’s church in metropolitan Melbourne. The setting was Halls Gap in the Grampian Mountains of Victoria, and Vivien ran the children’s ministry while Norman and I taught the Word to the adults. A large contingent from the US came to the 2001 camp. Some of these friends, before the camp and others after the camp, visited with Vivien and me in our home in a southern beachside suburb of metropolitan Adelaide. The last camp in the US was fittingly organized by Bill Morgan in 2010 and took place on the north shore of Oahu, Hawaii. Vivien was unable to fly with me this time, though she had visited Hawaii on previous trips. It was a smaller group of great friends who realized we were all getting older! (I was 77 by then.) There was a different speaker every day, and this time is fondly remembered. 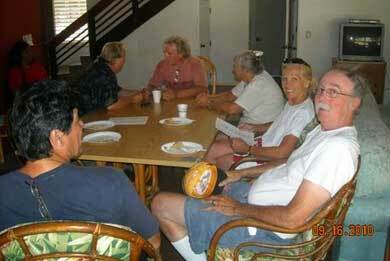 The photo shows a normal chat between sessions. On the far right is Mike Sommer, current President of Positive Words Inc. USA. Bill Morgan is at the top center. Not shown but present (and since gone to be with the Lord) is Geri Johnson. Following on from Bob Roberts, for two decades Geri ran our “fulfillment center” on the west coast of USA, mailing ministry materials and friendly notes to supporters. I started a website in 1995 in the early years of the Internet, that has for the past 22 years reached more people than all our ministry of the previous years. My teaching articles plus many pages of material from the great teachers of the past are available for free viewing here, plus two full video seminars and over 60 audio teachings. The email newsletter was commenced in June 2003 and so will be 15 years old in 2018. “To God be the glory, great things He has done!” and is doing! Hi, Kevin, and thanks for your congrats. Yes, Peter Daniels lives in the Adelaide area and I have heard him speak live, but I’ve never met him. He’s just a year younger than I am! All except one of those small booklets have been revised and republished, so they have had a good life. What do you teach, Kevin? Blessings from Australia. Congratulations on 60 years of ministry. I can’t believe it has been over 40 years since I met you at Now Ministry in Wagga Wagga, while I was Director of Borambola Sport & Rec Centre. The discussions about your talks and books over the next decade or so are still fresh in my memory. I still keep snakes and throw boomerangs – some things don’t change. May God continue to bless you.